The Ford Bronco may be coming back, but it looks like Land Rover will be leading the charge in the return of full-size two-door SUVs. The Range Rover SV Coupe is really happening and don’t worry, this is not going to be a sequel to the three-door Evoque. 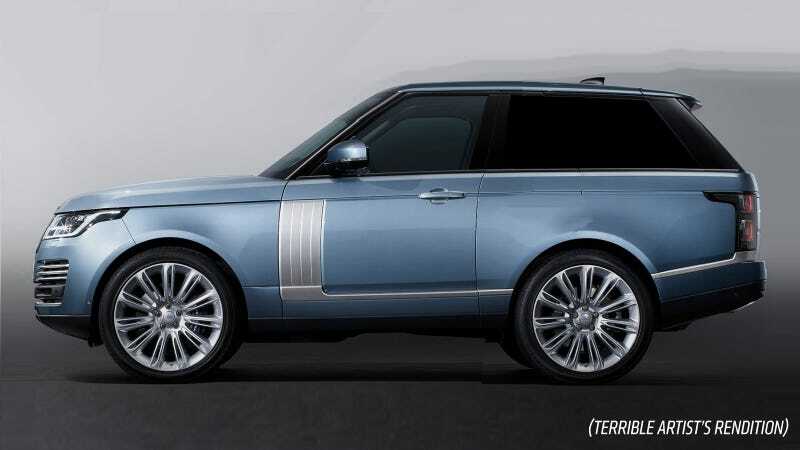 Land Rover has officially announced that it plans to build 999 two-door full-size Range Rovers at its SV Technical Center skunkworks. The good news is that the company plans to ship them worldwide. Don’t expect to see a whole lot of them though, even in areas like Manhattan and Rodeo Drive where Range Rovers typically roam and breed. The SV Coupes will be hand built, hence the low production target, and probably become instant collector’s items. Not sure how I feel about the high-contrast Moon Pie color motif on the seats, but that wood center console is ravishing and the shapes look appropriately posh for what will almost assuredly be a six-figure vehicle. I expect that the design will look a lot more elegant than the 2004 Range Stormer concept and subsequent knockoffs made by tuner companies. And it’s certainly going to be more stately than the cute little Evoque. SUV coupes like the two-door Bronco, Explorer and Blazer used to be all over the place before SUV “coupes” like the X6 and GLE Coupe took over. Blobs are in, bricks are out. But fashion is cyclical, and so too with automotive design trends. “Personal SUVs” are back, baby! Now where’s our 2019 Chevy Blazer at?